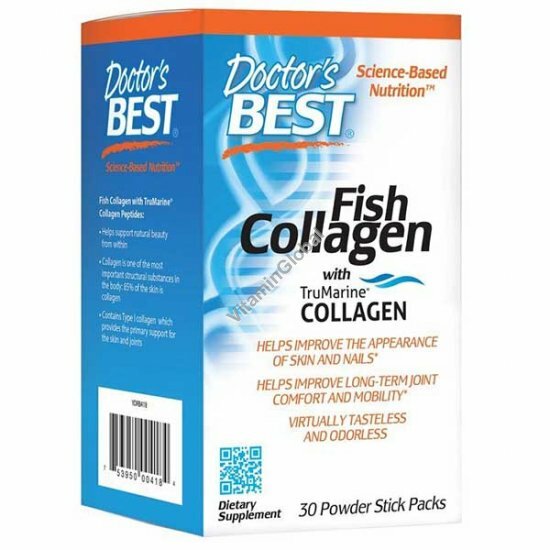 Doctor's Best Fish Collagen is a highly absorbable Type I collagen peptide from TruMarin Collagen. The low molecular weight provides rapid and efficient absorption for healthy skin, nails, and joints. TruMarin Collagen peptides contribute to healthy skin by increasing skin moisture, resulting in smoother skin and reduced wrinkle depth. Studies show that these small molecules in the collagen peptides provide superior bioavailability and digestibility. Contains no artificial color and is virtually tasteless. Suggested Use: Add 1 powder stick pack to your favorite beverage daily, or as recommended by a nutritionally-informed physician.